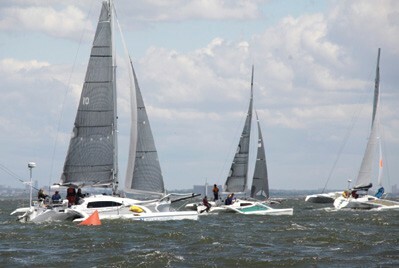 Ten trimarans from 25 to 44 feet competed in the first Gotham Multihulls Series in New York Harbor on May 31 & June 1, and we were all pushing hard around the Lower Bay just south of the Verrazano-Narrows Bridge. So what was a big blue-and-white trimaran doing on the racecourse? It was Banque Populaire VII, 105 feet long, 60 feet wide and 100 feet tall, flying its windward hull in about seven knots of wind and easily moving at twice windspeed. She slowed and tacked, then accelerated down the rhumbline to the finish. Her French team had, however, failed to pay the Gotham Multihulls Series entry fee and obtain a handicap rating, so they could not win. We organized this event as a new addition to the New England Multihull Association (NEMA) race series. Most of NEMA’s races are on courses shared with monohulls, and there are only a few monohull events that tolerate multihull participation. The Gotham Series, along with the Black Dog Dash in Vineyard Haven, MA, the Newport Unlimited in Newport, RI and the Poco Loco Bay Race in Staten Island, NY, is for multihulls only. The Gotham Multihulls Series supports Brooklyn Boatworks (brooklynboatworks.org), a unique program in New York City that gives middle school students the opportunity to build their own Optimist throughout the school year. The kids learn about cooperation, perseverance and craftsmanship, values that help them succeed in school and their future. We were supported by S-cruise by Smartboat, which loaned its innovative and stylish Smartboat 23 powerboat to handle logistics, photography and Sunday’s start, and had capable assistance from Jessica Todd-Marone, the Program Director at Brooklyn Boatworks. Participants included Steve Gross’ 44-foot Explorer Falcor, with a minus-50 rating; Glenn Reed’s Condor 40 Intruder, a large cruising tri; Bern Wyss and Laurent Apollon’s Dragonfly 800 Windsinger, the smallest in the fleet and skippered by legendary transatlantic multihull sailor Phil Steggal; and a bunch of Corsair models – Mike Divon’s Corsair 37 Milk & Honey; three Corsair 31s: John Sampson’s Flight Risk, Keith London’s Scooch Over and Pat Harris’ Gypsy Heart; two F-27s: Peter Vakhutinsky’s Tritium and Steve Parks’ Flying Fish; and my Corsair 28R Skedaddle. The Richmond County Yacht Club in Great Kills Harbor on Staten Island was our host, setting our skippers up with moorings and warm hospitality. Our first race, on Saturday May 31, was most exciting, with a north wind blowing down the Hudson and into New York Harbor at about 20 knots. We were set to start at noon just outside the entrance to Great Kills, with a start line set more or less at a right angle to the wind. Trimarans love reaching conditions, but with that much breeze the boats were barely in control and all were sailing with deep reefs, some with storm jibs, reaching at high speed across the starting gate. But not Skedaddle. We were still at our mooring in Great Kills Harbor, struggling to free the main halyard and get the mainsail up. I got hauled up to the masthead, pushed the halyard back into position on the sheave, and we hoisted the main about ten minutes before noon. Put a reef in? We couldn’t get that set right and make it to the start line on time. As we screamed along in waterfalls of spray toward the start, we radioed the committee boat. “You have about one minute left in the countdown,” was Jessica’s reply. The hell with reefing! We went for the start line and tacked away on port. Once we got Skedaddle in her groove, we were making time against the bigger boats. The course took us across the Lower Bay over toward Rockaway Point and then north, under the Verrazano-Narrows Bridge, up to a mark just east of the Statute of Liberty, with a finish on a line from the Colgate Clock on the Jersey shore to a point in Lower Manhattan. These are busy waters. There are container ships, tugs and barges, water taxis, the Staten Island Ferries, cruise ships, SeaStreak ferries, Liberty sightseeing cruiseboats, monohull sailboats, police and Coast Guard boats, DEEP enforcement boats, tankers, jet-skis and even kayaks, all going in different directions, and of course the fishing boats always anchored just where we needed to go. Tacking a tri upwind in 20 knots can be tricky at the best of times, and we needed extra precision and timing because a missed tack could leave us stuck in irons and at the mercy of the traffic. We tacked far over to the west side of the harbor by the Jersey shoreline before turning toward the Statue of Liberty, where tourists lined up on the island and sightseeing boats jostled for position around it. We left the final turning mark to starboard and turned from the Statue toward the finish. But the blue skies that greeted us in the morning and ushered in this northerly blast suddenly gave way to an ominous storm head rolling down the Hudson River. We pointed high up the river as the rain began to spatter down and squalls of wind buffeted us. We were third to cross the finish line, close enough behind the Corsair 31 Flight Risk to know that we would correct out ahead on handicap. But Falcor, the 40-foot Condor, having shaken out the reef in her main and switched from storm jib to racing jib just south of the Verrazano, had blasted north with her minus-50 handicap rating to finish the 15.5 mile course in 2:23, too far ahead for any handicap correction to help us. Most of the fleet stayed over Saturday night at Liberty Landing’s Pier 25 Moorings in Hudson River Park, and the crews convened for dinner and drinks at Josephine Café Francais, an excellent restaurant located a couple of blocks away at 350 Greenwich Street in Tribeca. Sunday dawned sunny and beautiful and stayed that way, but the breeze had disappeared. It felt like the race would be a downwind drift, but we started just below Governors Island with a whisper from the southwest. Skedaddle crept along the Brooklyn shoreline, but that proved a poor strategy, as Flight Risk settled into what looked like a commanding lead further out in the main channel, perhaps catching a stronger southerly current out there. We all carried screachers, and when we tried our spinnaker we lost ground as it failed to get any flow, and the sail changes slowed us. The race committee had set a tentative finish under the Verrazano-Narrows Bridge if the wind did not pick up, but called for continuation of the race when we could all see ripples on the waters below the bridge. Now we were racing, though slowly, toward West Bank, a shoal area in the Lower Bay. That’s when Banque Populaire VII showed up, first as a dark blue smudge in the distance behind us in New York Harbor, then becoming larger as she squeezed under the bridge and into the bay. We were racing against our fleet, but with our cell phone cameras shooting the maxi trimaran, you could say we were a bit distracted. 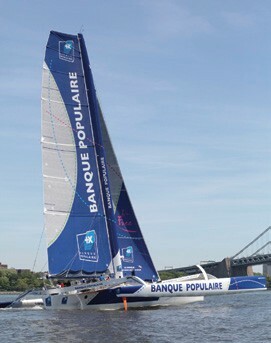 Banque Populaire VII was in New York waiting for a weather window to make an attempt on the transatlantic record. Skipper Armel LeCleach will be sailing this monster solo, trying to beat Francis Joyon’s singlehanded record of five days, 13 hours from Ambrose Light to Lizard Point. While waiting for that perfect prediction of a low-pressure system that might take LeCleach eastward at a record-breaking pace, he and his team have been training and tuning the boat, roaring around New York Harbor. Our race organizer Laurent Apollon contacted the BP VII team and informed them of our racecourse, and they obliged us with an amazing demonstration of tri-power. “Yes!” we all said. We want one of those, though who among us could manage such a boat solo, let alone race across the Atlantic? 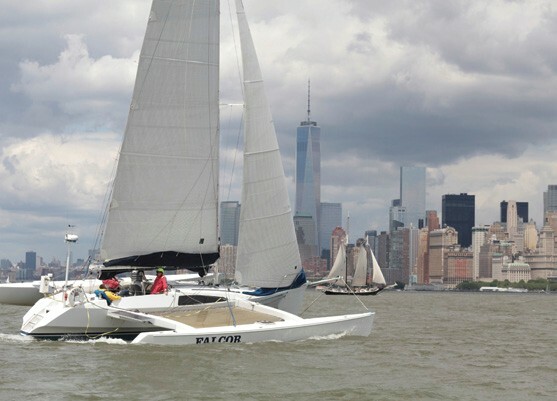 The 105-foot Banque Populaire VII is in New York City as skipper Armel LeCleach awaits a weather window for a solo transalantic record attempt. As BP VII shot off into the distance, we were left to leg it out for the finish line, far off her pace. This time, the F-27s Flying Fish and Tritium carried the day. The fleet enjoyed a fine, challenging weekend. We look forward to building the Gotham Multihulls Series next year and to sailing again around the Statue of Liberty. Meanwhile, we wish Banque Populaire VII a fast and safe crossing. The Gotham Multihulls series is open to all multihulls with a NEMA rating. For more information including sponsorship opportunities, visit http://gothammultihulls.com/. You’ll find NEMA’s racing and cruising schedule at http://nemasail.org/. Andy Houlding is an attorney in Hartford, CT, a dedicated multihull sailor and editor of the excellent NEMA newsletter. Photographer Laurent Apollon is also a multihull sailor and freelance journalist in New York, NY.